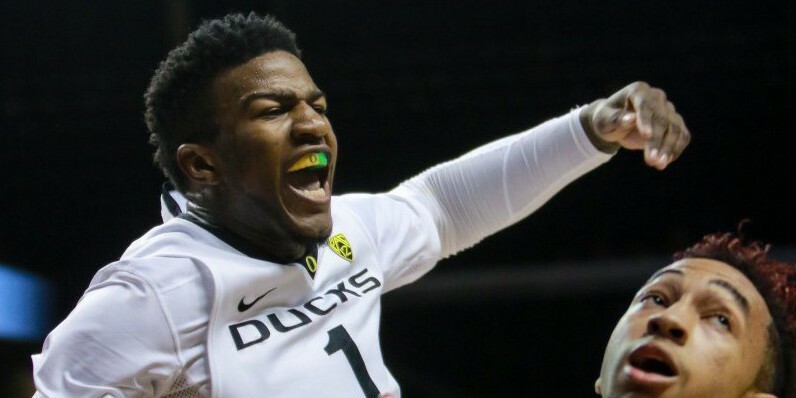 Freshman Jordan Bell had 3 blocks in Oregon’s victory over USC last night. The Ducks‘ 75-67 victory over USC at Matt Knight Arena was a special night for two of Oregon’s most charismatic and effective players. Senior Joseph Young scored 19 points, becoming the 33rd Duck in Oregon basketball history to reach 1,000 career points. Jordan Bell, Oregon’s dexterous defender, grabbed 13 rebounds and recorded his 66th block in 19 games as a freshman. Currently, Bell is averaging 3.5 blocks a game for Oregon and has already smoked former Duck Tony Woods‘ single-season record of 51 blocked shots and is on pace to shatter Oregon’s career leader Blair Rasmussen‘s record of 116 blocks in 114 games. Bell’s rapid transition from Long Beach Poly high school to Division 1 college basketball is nothing short of amazing, establishing himself as one of the Pac-12′s most prolific shot blockers. As a junior at Long Beach Poly high school, Bell averaged 4.7 blocks per game. The Ducks’ freshman “Sultan of Swatting” has blocked more shots than most teams in the NCAA, including Arizona (61), Oregon State (65), and Florida (62). Thanks to Bell, Oregon ranks 12th in the nation in blocked shots, with a team average of 5.9 blocks a game. So, what does Bell attribute to his stunning ability to cast fear in the hearts of opposing shooters? “It’s really just a natural gift. I just started playing basketball in 9th grade and it’s just something I was always really good at. I don’t practice it, it’s just a gift,” Bell told Mike Montgomery of Pac-12 Networks. Bell’s innate defensive and rebounding abilities combined with Young’s consistent scoring continue to provide the Ducks with opportunities to win in every game. While the Ducks’ are 13-6 overall and 3-3 in conference play, players such as Bell have the future of Oregon’s men’s basketball looking brighter every week.